Talked with Some UP Managers on PTC Issues They have had some reports of crews putting a higher Equipment speed in PTC to allow to run couple miles an hour over speed without Over Speed warnings. Management has stated they will consider this as tampering with Safety Equipment Critical Rule violation and possible Desert! (Not Happened on STL Service Unit that they know of yet) Be sure when making pickups and setouts update PTC before departing. If you have to do a soft cutout account PTC issues such as getting by signals and through form Bs You must stop at earliest convenience and reengage PTC. INDEPENDENCE, Ohio, March 15 — It has been brought to our attention that some United Healthcare members have received unsolicited phone calls from Tennessee and Georgia area codes from individuals posing as United Healthcare representatives. These calls have been identified as a scam. The caller from the Georgia area code used the number 678-384-4965 to make the call, and left a message to call back on 888-315-7524 and ask for United Healthcare options. The caller also asked for personal information, such as the member’s social security number. Don’t respond to any calls from phone numbers you don’t recognize. • If you receive an unexpected call or text from any area code/phone number you don’t recognize, never answer it. If it is someone with a legitimate inquiry, they will call back or leave a message. • If you do answer it and you believe the call is suspicious, call the Member Services number on the back of your medical ID card to speak with a Customer Service Representative. • Always be sure to review your phone bill carefully and contact your carrier about any suspicious charges. • If you or someone you know becomes a victim of a phone scam, you can file a complaint online with the Federal Trade Commission (www.ftc.gov/) and the Federal Communications Commission (www.fcc.gov/) under the “For Consumers” tab. Union Pacific Corp. UNP -1.46% riled employees recently when it started flying drones over some of its railroad yards to ensure workers were following safety guidelines. Mr. Simpson, whose general committee represents 1,600 conductors, engineers and other rail workers in the southern U.S., also advises members on complaints to the Federal Aviation Administration and Federal Railroad Administration. He said there is no way to distinguish a drone flown by Union Pacific from one operated by an unauthorized party. As of March 1, Union Pacific temporarily grounded the aerial observation so it can share its findings with the unions but plans to resume the program in coming weeks. “Their leadership will help us establish a collaborative process to address unsafe behaviors and protect employees,” Union Pacific spokeswoman Raquel Espinoza said. Mr. Simpson said he suspects safety isn’t the company’s only motivation. Workers see drones as a means to discipline them, he said, with escalating penalties that can lead to termination. There is no indication anyone has been fired for an infraction spotted from up to 400 feet in the air, but Mr. Simpson said workers have been cited for violations as a result. Ms. Espinoza said Union Pacific has been using drones to conduct federally mandated field testing and will coach employees to correct behavior that could cause serious injury. “We are finding drones are valuable tools that can help us reach our ultimate goal of operating in an incident-free environment and ensure employees go home safely,” Ms. Espinoza said. She added that the company hotline has received only one complaint about the use of drones. Union Pacific last year reported its second safest year on record, though the reportable personal-injury rate of 0.79 per 200,000 employee hours was 5% higher than in 2016. The amount of money it sets aside for personal-injury liability has declined in each of the past three years. Drone use is still in its infancy in the railroad industry. Companies have sought to incorporate it into operations to inspect bridges and track, assess damage after natural disasters and map their networks. Other proposed or active uses have included spotting trespassers, air-quality tests and aerial photography. Earl Lawrence, who runs the FAA’s drone-integration office, said he was unaware of any other industries where employers are using drones to enforce safety rules. “Every day we see inventive ways of using aerial platforms,” he said. Berkshire Hathaway Inc.’s BNSF railroad, which, like Union Pacific, operates in the Western U.S., has worked closely with the FAA to find ways to incorporate drones into its operations. After obtaining waivers to fly drones outside the line of sight of their operators, BNSF in 2015 flew an unmanned, fixed-wing aircraft over 270 miles in New Mexico to inspect tracks. The railroad said it was the first commercially operated drone to fly beyond its pilot’s line of sight within the lower 48 states. Since then, BNSF has received permission to conduct tests on more than 2,000 miles of track, including at night. Norfolk Southern Corp. uses drones only for bridge inspections, a spokeswoman said. CSX uses the aircraft to monitor its rail network, collect data and conduct security checks. Drones also have been used as part of installing so-called positive train control, a new, federally mandated safety system, a spokesman said. Union Pacific first received FAA approval to use drones in 2015. It now has 126 employees on staff certified to fly them and has used them to inspect bridges and flood damage, among other uses. Union Pacific plans to have as many as 250 trained drone pilots by the end of 2018 and is also looking into self-flying drones. Union Pacific first deployed drones to monitor employees in December 2017 at a rail facility in Ste. Genevieve, Mo., later expanding to 14 locations. While railroads already make use of fixed cameras to monitor operations, aerial footage provides a new vantage point for yardmasters in facilities that can be more than 100 tracks wide and scattered with visual obstacles like cars and equipment. When moving and your train goes into emergency it is imperative to remember to follow the procedure outlined in the GCOR. The procedure is the same if you place the train in emergency or if it happens on its own. The are a few keys to remember from GCOR 6.23. First, procedure is to be followed if the train is stopped due to an emergency application or severe slack action. Don’t wait to see if your air will recover for the first step. If you are next to another main track or controlled siding, you must immediately warn other trains first, then notify the dispatcher using 911 on the radio. This is important because at this point another train could be close to passing you and your train could very well be fouling their track. The next important part to remember is what to do when notified that a train you are about to pass is emergency. You must pass the train at restricted speed until it is known that the train is not fouling your track. If your air recovers and an inspection is not required, it would be wise to wait until you get the train moving again before notifying the dispatcher that trains may pass at normal speed. Finally, we need to know whether or not a walking inspection of the train is required. If your air does not come up and you have to walk and end up finding the problem, remember that you still have to inspect the rest of the train as well. You only have to meet one, not all, of the exceptions to be relieved of inspecting the train. • Train is made up entirely of double stack well cars and/or five-platform articulated single-level spine cars. If you are a key train or experienced severe slack you are walking regardless of the exceptions. If there is a condition that prevents walking, bridge or something like that, you can pull the rest by at 5 MPH. Compliance with 6.23 is critical. There is more at stake that just getting into trouble. This also about looking out for our brothers and sisters out here. Think about passing a stopped train at 60 MPH only to find cars from their train on their sides on your track. Take it another step further, imagine that car is tank car loaded with hazardous materials. Did You Know there was a Superintendent Bulletin recently issued making a few changes to the safety stop requirement? •Moving through gates or doorways (notice that this does not specify only while shoving). A place that come to mind is Hillcrest. The big change to requirement is the exception. The only exception is a safety stop is not required while making a coupling with light locomotives. As a side note, Safety Rule 81.13 only states that you cannot ride a car to a coupling. It does not say you cannot ride a locomotive to a coupling. Speaking from experience, when coupling to a locomotive, be sure that the air hose is not stuffed into the coupler. The switching exception is no longer in the bulletin. I’m sure you have all read this by now, but I thought a reminder would be helpful. 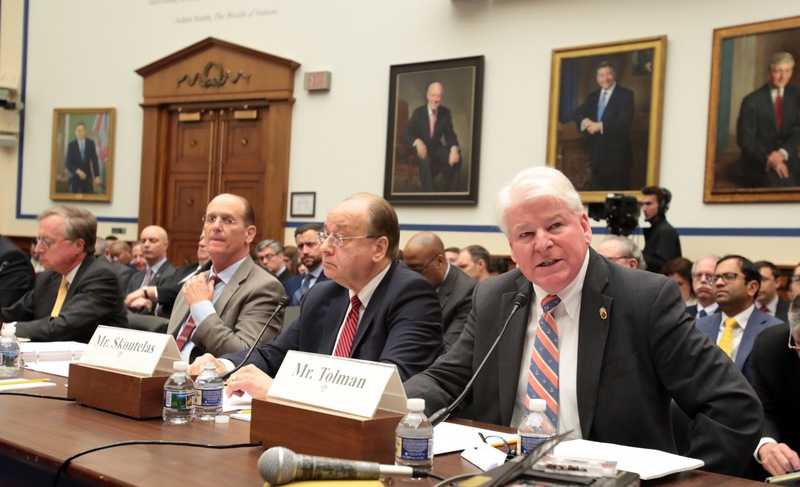 INDEPENDENCE, Ohio, February 15 — BLET Vice President and National Legislative Representative John P. Tolman urged Congress, the railroads, and governmental regulators to ensure that Positive Train Control (PTC) is fully implemented by the current deadline of December 31, 2018. During his testimony, Vice President Tolman also discussed the problem of electronic device distraction (Trip Optimizer and LEADER); the government and industry’s failure to address rail worker fatigue; the danger of excessive train lengths; and the need for two person train crews. Tolman began his testimony by expressing his anger and frustration at having to yet again testify at a hearing where preventable rail accidents and fatalities were the main topic of discussion. With passage of the Rail Safety Improvement Act of 2008 (RSIA), Congress mandated the implementation of PTC nationwide by the end of 2015, then — under pressure from railroads — extended that deadline until the end of 2018. Many PTC-preventable crashes and deaths have occurred during the three year deadline extension. According to a 2015 report from the National Transportation Safety Board, PTC could have prevented 145 rail accidents that killed 288 people and injured 6,574 since 1969, when the agency first recommended the technology. While PTC was mandated by the RSIA of 2008, the law also addressed the issue of rail worker fatigue. However, the fatigue has not been sufficiently addressed in the past 10 years. Vice President Tolman reminded Congress of this glaring oversight during his testimony. Vice President Tolman encouraged all members of Congress to consider bipartisan support for two-person crew bills that are progressing though the House and Senate. He thanked Representative Don Young for introducing the Safe Freight Act (H.R. 233) and Senator Heidi Heitkamp for introducing S. 2360, a companion bill in the Senate. Both measures would require two-person train crews on freight trains. The hearing was titled “Oversight of Positive Train Control Implementation in the United States.” Additional witnesses included: Richard Anderson, Chief Executive Officer, Amtrak; Juan D. Reyes III, Chief Counsel, Federal Railroad Administration; Robert Sumwalt, Chairman, National Transportation Safety Board; Edward Hamberger, President and Chief Executive Officer, Association of American Railroads; and Paul Skoutelas, President and Chief Executive Officer, American Public Transportation Association. INDEPENDENCE, Ohio, February 12 — In the wake of recent dramatic and highly visible railroad accidents in the United States and Canada, there has been a trend to criminalize railroad workers and prosecute them as the sole cause of these tragedies. The Brotherhood of Locomotive Engineers and Trainmen stands opposed to such actions. It is a travesty that criminal charges were filed against three former employees of the Montreal, Maine & Atlantic Railway for the tragedy of July 5, 2013 in Lac-Megantic, Quebec. The trial against them began in September of 2017 and concluded on January 19, 2018. What jurors found out is that railroading is a complex system of operations, and many factors go into a safe operation. Determining the root cause of a particular accident is far more complex than simply blaming the workers, but that all too often is what many rail carriers and government agencies have done. In 2017, criminal charges were brought against the locomotive engineer of Amtrak train 188, which crashed in Philadelphia on May 12, 2015. Those charges were dismissed in 2017 after a judge ruled that the crash was accidental, not criminal. The engineer’s lawyer argued in part: “The law recognizes there’s a big difference between an accident and a crime.” However, a second judge has ruled that dismissal of those charges was wrong, and has reinstated charges of reckless endangerment, involuntary manslaughter, and one count of causing a catastrophe. The operating employees who crew trains and locomotives — locomotive engineers, conductors, brakemen and switchmen — have extraordinary safety-critical tasks and responsibilities not found in other industries. An operating employee’s readiness for safety-critical constant vigilance is a personal obligation. But this personal duty must be effectively supported — not thwarted — by a management devoted fully to the fundamentals of safety. Railroad crew members sometimes go on duty without being allowed sufficient rest, and with accumulated sleep deficits, consequently constituting a profound safety problem on and along the tracks. Laws are such that crew members are not given enough time to simply rest and have a normal life. On the Amtrak property, many of our locomotive engineers work six-day assignments resulting in operations in excess of 2,500-3,000 miles per week. At times, the crew members are harassed and intimidated if they repeatedly request to lay off for needed rest. Moreover, they have to contend with abiding by unrealistic attendance policy standards imposed by the carrier that often result in disciplinary action despite the fact that additional time off is both necessary and fully warranted. Crew members who are harassed and intimidated by railroad managers are less likely to provide feedback regarding unsafe operations. Such feedback is crucial to safe train operations. To please Wall Street investors, railroads have furloughed so many workers that the few who remain are often overworked and stretched too thin. Railroads are increasing the length of freight trains to dangerous levels, trying to do more with fewer workers. Well-rested crew members are essential to safe train operations. Railroad crew members sometimes complain that they are not given sufficient familiarization trips to become acquainted with the lines over which they operate. Proper training is essential to safe train operations. At times, crew members protest to railroad managers about hazardous operations, but their protests simply go unheeded. Properly maintained equipment and tracks are essential to safe train operations. This is not to make excuses, but an effort to explain that it takes more than just blaming the worker to determine the root cause of railroad accidents. Our thoughts and prayers continue to be with the victims, families and workers touched by the accidents mentioned above. But criminalizing the worker is not part of the solution to eradicate similar tragic accidents from happening again. When being called to step up or fill a vacancy the "Option 9" has been changed from Refuse Call to Decline call. This will allow the you to decline the call with out being put into refuse status. Similar to the way it use to be. There will be a messages that now incorporates later in the call that confirms you are being called to step up vs being called. INDEPENDENCE, Ohio, February 1 — On January 30, 2018, Senator Heidi Heitkamp (D-ND) introduced S. 2360, a bill that would mandate a minimum crew size for freight trains in the United States. The bill was read twice and referred to the Committee on Commerce, Science and Transportation. It has immediately garnered four Senate co-sponsors: Senator Tammy Baldwin (D-WI); Senator Ed Markey (D-MA); Senator Sherrod Brown (D-OH); Senator Angus King (I-ME). This bill marks the first time a minimum crew-size bill has been introduced in the United States Senate. Representative Don Young (R-AK) introduced a companion bill — H.R. 233, known as The Safe Freight Act —in the 115th House of Representatives on January 3, 2017. It currently has 75 bipartisan co-sponsors. Text of the Bill will be available usually 1-2 days after introduction of the bill on the floor of the House or Senate. Senator Heitkamp (D-ND) has long been an advocate for rail safety improvements, even more so since a collision between a crude oil train and a derailed grain train in Casselton, N.D., on December 30, 2013, which caused a huge fire and evacuation. The impact of the Casselton derailment was lessened significantly thanks to the bravery of the multiple crew members who were aboard the locomotive. Like Senator Heitkamp, Senator King (D-ME) is also an advocate for rail safety. His home state of Maine is near Lac-Megantic, Quebec, where an oil train derailment and subsequent fire resulted in 47 fatalities on July 5, 2013. A one-person train crew operated the oil train in the Lac-Megantic tragedy.